I am a trained Kathak Dancer and running my own institute for the past 15 years. An examiner at Gandharva Mahavidyalay for Kathak Dance Exams. I have judged various dance competitions at city levels and participated in many state and national level programs. When did you start learning dance? I started learning when I was in 1st std. I started learning as a hobby and for the initial four years I learnt various styles like – Kathak, Bharatnatyam, Manipuri, Odisi and Folk dance forms. From 5th Std, I started learning from Guru Pandita Shama Bhate. I went on to take dance as my primary subject at college level and did a BA in dance from Lalit Kala Kedra, Pune University. How did you decide to take it up as a career? What started as a hobby soon turned into a passion. While I was in high school, my Guru Shama Bhateji and Sureshji Talwalkar suggested it to me and even discussed the same with my parents. They clarified my parent’s doubts and were very understanding. With so much confidence being bestowed by my guru, my parents agreed to the suggestion and supported me in my journey. how different is the learning process from normal colleges? All dance universities have gurukul system in India. There are two parts to the learning process – theory and practical learning. While the theory portion is covered in college via lectures, the practical training is to be done with a Guru. Usually, universities have a prescribed list of guru’s and you need to choose your guru from that. All performing arts education admission is based on entrance exams. You have courses from graduation to masters to PhD level in the university system. Apart from this there are separate examinations conducted by Gandharva Mahavidyalay which is equivalent to University level BA or MA degrees. What is the life of a professional dancer? How is it like? Daily riyaaz and being aware about what is new in your field is extremely important. There will be a minimum 2-3 hours of practice every day. You need to be attuned to the latest happenings and explore various genres like fusion or Bollywood music. Dance is a physically intensive field. Apart from practice, there will be a lot of travel involved as programs happen all year round and all over India. You will have to build your network and take up performances depending on your capacity. Nowadays there are troupes focusing on classical dance. They call dancers from all over the world and perform together based on a concept. What are the requirements to take dance as a profession? Consult your Guru to understand your performance level. Your guru is the best person to guide you. This is an intensive field and you need family support. You need to work on your physical and mental stamina as once you take it as a serious career option, it easily involves 8-10 hours of training. Another thing that I would like to tell the parents and the students interested in pursuing this career is that there is no immediate glamour. The ever increasing reality shows, show only a part of the actual efforts put in by a dancer and there should be enough thought put in before taking it up professionally. WHAT KIND OF SUPPORT SYSTEM DO YOU NEED TO MAKE A FULFILLING CAREER IN DANCE? Classical dance forms or any dance forms are physically and mentally challenging. For starters, you need 8-10 years of economic support. When you start giving solo performances you will need good stage, good music, costumes, etc. Learning some video and sound editing skills will be an added advantage. If you are performing with live music, you need good musicians and good support dancers. Any tips for those planning to take it up as a career? Don’t fall for the glamour. You will be required to learn for atleast 10-12 years. Your training will be rigorous and one-to-one. Choose an able guru, who will not only teach you the techniques but will also help you explore your creativity and present challenging topics and styles. Keep realistic views about the career and focus on building your network. What are the career options in this field? After learning Kathak at BA or MA level, apart from being a professional dancer, you can be a faculty at performing arts universities or you can start your own dance academy. There are also career options in the field of dance related costume designing, make-up and stage management. Apart from my dance institute, I teach two Indian girls in Germany via Skype. So that’s a new way to explore. If you are following your passion or want to bust some myths about traditional careers, then do fill in the GoogleForms and I will feature you on my blog. The career does look full of glamour but it’s not a piece of cake. I can see it takes a lot of blood sweat and tears to be perfect at it! What a wonderful feature – thank you for introducing such a personality to us. I leaned kathak for an year during school days, but somehow could not continue. Loved the statement by Ms. Katkar – Don’t fall for glamour! Seems to fit today when aspiring dancers, kids want immediate success. Hard work is the only KEY. Lovely post. She is so right when she said mental and physical stamina is very important in this field. Dedication, hard work and discipline are the key elements. My daughter is learning Bharatntyam and I hear the same words from her Guru as well. It feels great seeing someone chasing and living a dream they’ve wished for. I feel proud seeing her taking dance as her professional career. The world has come so far because of people like her who dare to dream. It was a lovely read! The Blog is totally about passion, dedication and hard work. Your passion for dance is clearly displayed in the blog. That YouTube video is so graceful. I hope you had great time interviewing. I could never learn how to dance. I was more into sports. But I will make sure my kids do. Thanks for sharing these insights. So inspiring interview yes choosing what you love to do as carrier works best . Such an inspiring interview, indeed dance can have such a great career if pursued seriously. Nice read !! She started when she was in 1st std. I salute her for her dedication. Thanks for introducing us a great dance.. Love to read it.. Thanks For Sharing This Post .. Dancing can prove a Great Career For Young Kids..
Great personality… I really love dancing and did alot in my school days, now I encourage my daughter and really want to see her performing on big stage. Nice to hear of somebody taking up such a profession – I could have never imagined! Hard work pays in any field! Hats off to Leena Tai for her dedication and hard work. My daughter is learning kathak under her guidance. As Tai is strict as well as very much friendly she is enjoying a lot. Proud to have such a nice guru for my daughter. 8 to 10years of economic support needes and similar training.Its not glamour from day one. 8 to 10years of economic support needes and similar training.Its not glamour from day one.A realistic and inspiring story . I really am keen to get my little girl train in classical dance. This post is really helpful. Thanks for sharing. Wonderful post.. thanks for introducing her.. awesome tips shared, n so true that one does need good stamina and perseverance to pursue dancing.. Dancing has always been a passion but looked down in my school and college days. There are parents who still consider it a past time or hobby. I just got my daughter who loves dancing enrolled in Bharatanatyam. More power to you rohini! Wow! hats off to all the artists! So much hardwork and dedication is what gives them this result . Such an inspring read. A lot of dedication and persistence is required to make a successful dance career, she started as early as Std 1 was a good thing. I am sure during those days when resources were scanty and finding a right guru wasn’t easy, your parents paid so much attention towards you and your love for this dance form. Glad to know about you Leena. I am a big fan of Leena Ketkar ma’am. Dance is one form of true love! Thank Neha for sharing about her. This was a wonderful interview.. had a great time reading this. I am glad people are taking dance as a career and not only as a hobby. thanks for sharing such a great dancer through your post. thanks for interviewing her especially the video. Sheer hard work by her brought her to such a great height. This is not easy. Loved the way in which interview is written. Dance as a career is definitely gaining wider acceptance . 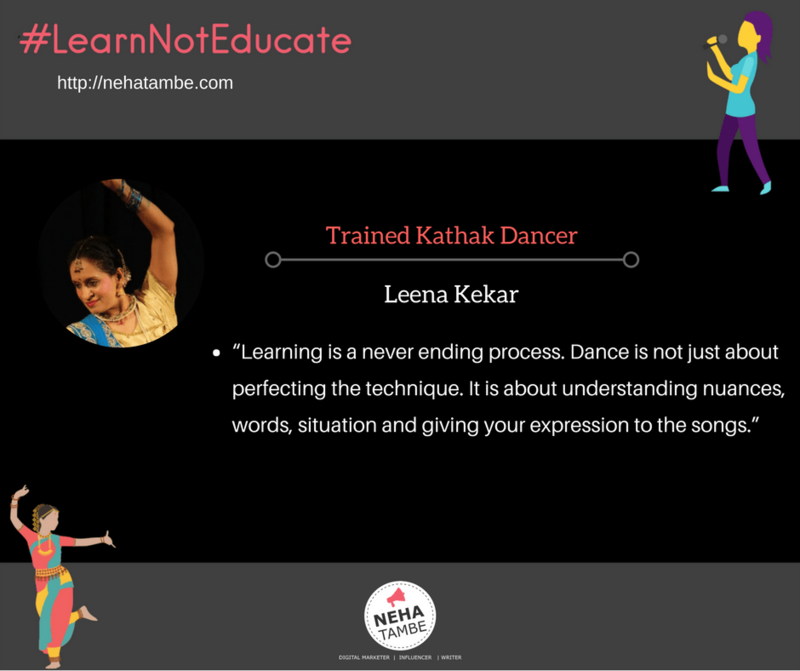 Mrs. Leena Ketkar has really helped clear a lot of things about Dance as a career . Dancing is an intrinsic part of Indian culture. And i am really happy to read about such a lovely personality.. Its really sound great to choose dancing is an career not hobby..